My pal Brian emailed me about the possibility of an early session at the coast this weekend so I thought I'd have a recce this morning to see what was about. As usual I was armed with three rods. This would normally be a bit of a pain but the place I was fishing doesn't allow any long walks. In fact because I am stuck in one spot two of the rods are normally propped up against a handy rock while I fish with the other one. 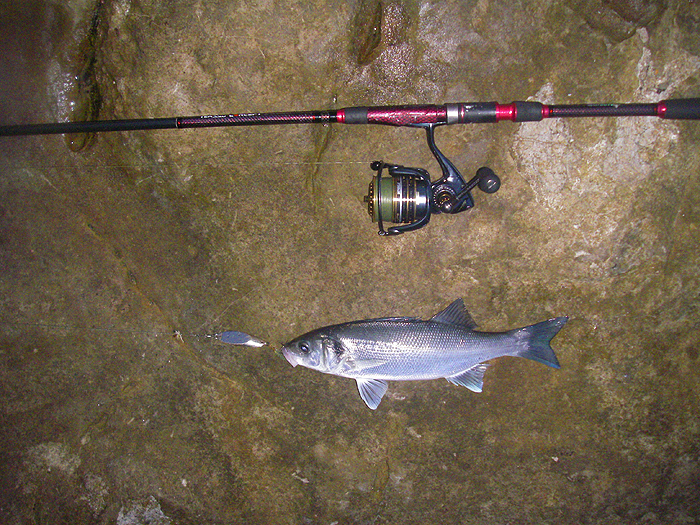 I had a spinning rod armed only with a 6/0 circle hook to be used for freelining a mackerel livebait, a fly rod with a floating line , 8lb leader and a small white Delta eel to provide sport with fish feeding close to the rocks and lastly my Teklon spining rod with the new(ish) Mitchell fixed spool reel, Nanofil (still no tangles) and a Dexter wedge fitted with a single hook for catching mackerel baits. As it turned out I could have left two of the rods at home and caught a few more fish. It was pretty dark when I scrambled down the cliff to my stance on the rocks but I could see that there was a big swell and lots of white water at the base of the cliff. After watching the waves for a few minutes I decided that it was safe to fish so I picked up the fly rod and began to draw the fly back just under the surface. For five minutes - not a sniff so I opted to have a go at catching a mackerel for bait on the wedge. After a couple of short casts to loosen the line I pitched the lure out into the gloom and immediately had a knock which didn't stick. The next three or four casts all produced tapping bites and eventually I was in. I couldn't see the fish but the rod was bouncing about like a mad thing as I reeled in my catch. 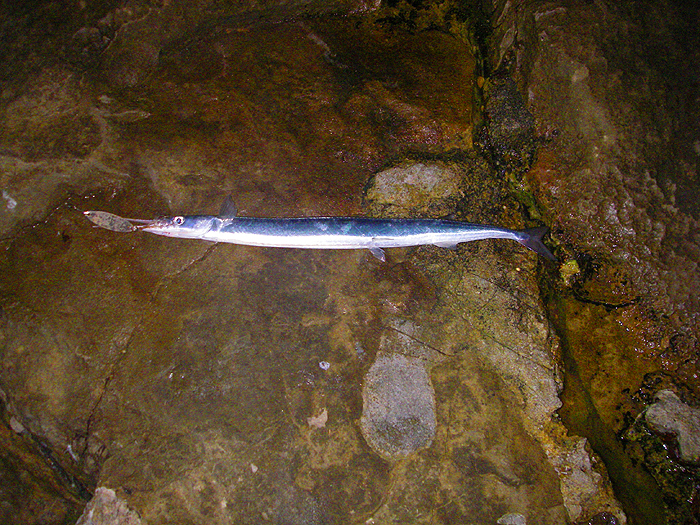 It turned out to be a garfish which explained the many missed bites. I took a picture before returning the fish to the sea and a couple of casts later I had another one of similar size and just as jumpy. Next cast I had a heavier bite and after a short battle landed a decent (for here) pollack of over a pound. Now it was pollack time and I caught fish fairly regularly - all of reasonable size. Then I had a bite close in which at first, from the vibrations passed up the line, felt like a small mackerel. 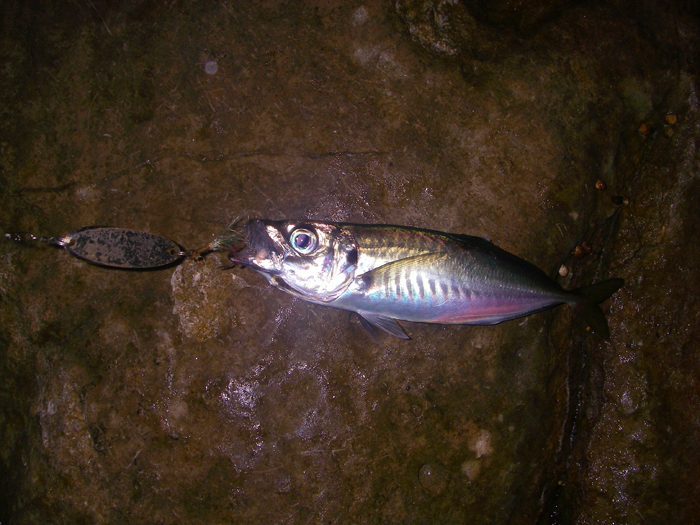 However, the culprit this time proved to be a small scad. Two more scad followed - one of them quite a big one. In between the scad I had another pollack. By now it was getting quite light and I was thinking of packing in if I couldn't catch a mackerel for bait. I hurled the wedge far out for the umpteenth time and about half way through the retrieve I had a bite which I thought at first was the long awaited livebait but it proved to be a bass of perhaps two pounds. Disappointment was mixed with pleasure at catching a fourth species. The next two fish I hooked were both bass, one of them a good size (three or four pounds). 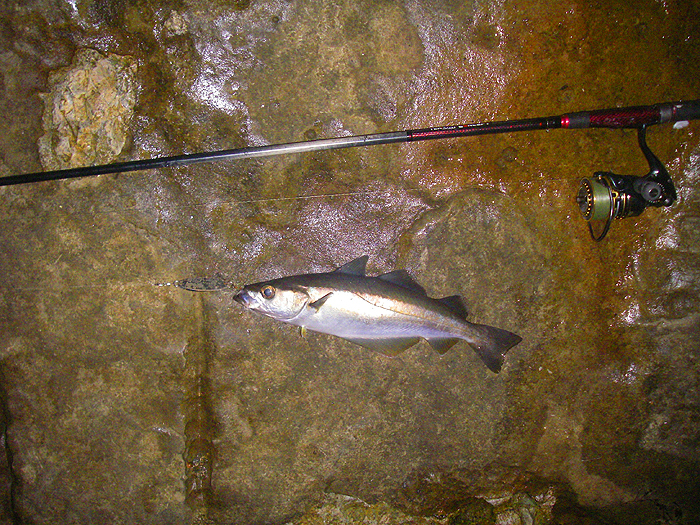 The larger fish put up a real battle but it unhooked itself after I'd slid it onto the rocks and before I could pick it up to have its picture taken. I knew that this one was a bass as soon as it took from the strong resistance and splashy fight. Even if I caught a mackerel now there would have been insufficient time for me to livebait. Anyway, two garfish, five pollack, four scad and three bass - not bad for an hour's fishing. If the weather's reasonable perhaps we'll do OK at the weekend, maybe I'll even catch myself a bait?